Just wanted to let you know that the position mentioned in my previous mail, finally went in to profit (right on futures after a few days, plus also had the benefit of time decay on sold options). What I liked about this trade is, even though I was initially in loss, I did not have to bother much as the position is properly hedged. In this particular trade, I exit with around 1.7% profit. In fact, as I am writing this mail, the market is shooting up in the futures direction, after I exit the trade with small profit. But considering tomorrow is expiry, did not want to take chances. And most importantly, I do not have the “should have” attitude. Overall, in a margin of 55k, I took 2 trades within a period of 10 days and my overall profit is around 5%. I know the directional trade could have made much more, but considering the market is highly range bound for the past few weeks, this seems good enough for now. Having been in the markets for several years and spanning through a lot of Technical Analysis, the only thing which I was unable to learn is proper control over emotions / risk management, due to the fear of losing money. Burnt money on intraday trading. However, after learning about the directional strategy, I know that all my TA knowledge can be used but this time without any fear/worry/emotions. Thanks for sharing your strategy with others ! 1. Technical Analyst losses fear of trading because the trades are properly hedged. So if you are TA my course will give you confidence of trading and you can start trading without fear. Note that even if you are NOT a Technical Analyst you will still trade without fear because your trades will be properly hedged. 2. 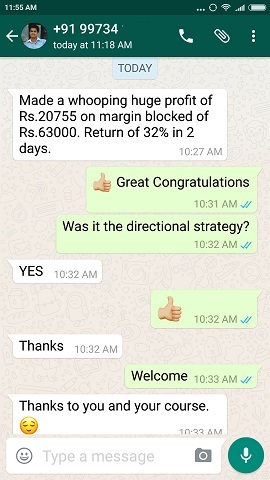 5% profit in 10 days in the directional strategy. 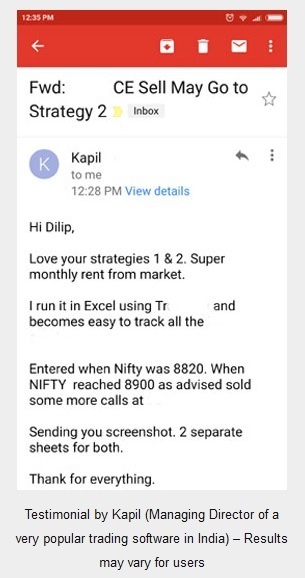 Though results may differ for everyone the point is this strategy will immensely help if you are an experienced trader especially if you trade Futures. 3. Margin blocked will be only Rs. 55,000/- to take one lot trade. 4. The strategies will help you to have control over emotions like greed and fear and you will by default do proper risk management while trading because the hedges will manage your risks. Now tell me if all the above conditions are met why will you not become a successful trader after doing my course? 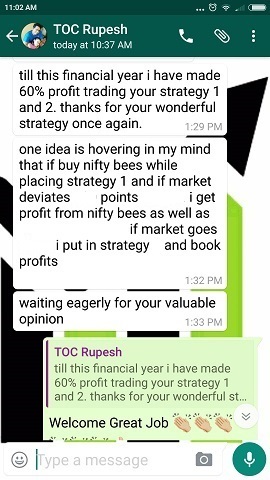 So please do my course not just for the 5 strategies it has, but more for the knowledge of hedging you will learn in the course. Remember that investment in knowledge gives the best returns. Do not delay your decision especially if you are losing money trading. Do the course today else by the time you enroll you may lose ten times the cost of the course just by trading. Note that to do the course you do not have to go anywhere. You can do it from your home. 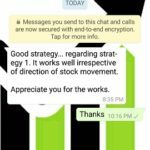 Strategy 1 can be traded the very next day you get the course materials. 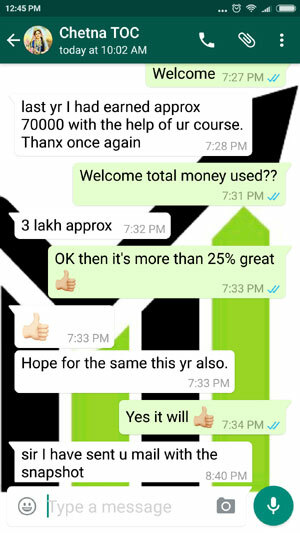 Just two Strategy 1 trades will recover the cost of the course making the course free and my support for 1 year also free. What more do you want? Investment in knowledge gives the best returns.